The Essence of Entrepreneurship and the Nature and Significance of Market Process is a continuation of the discourse started in Kirzner’s earlier work, Competition and Entrepreneurship, expanding upon his ideas about entrepreneurship and entrepreneurial alertness. 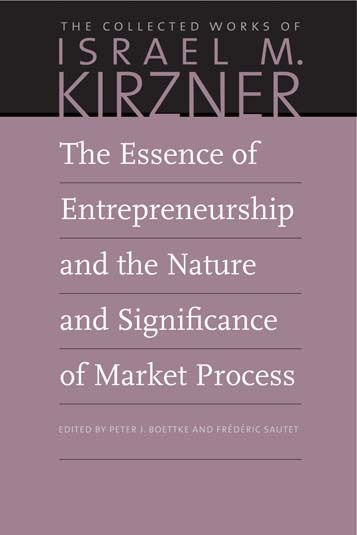 Essence presents most of the detailed research Kirzner has done on the nature of entrepreneurship and the entrepreneurial process in the decades following the publication of his magnum opus. It is during that long period that Kirzner elaborated his approach further, responding to objections and critics, and offering the world a more systematic understanding of the concept of market process. In the words of the volume editors and in contrast with traditional microeconomics, “Kirzner’s view of the entrepreneurial function in the market process consists primarily in liberating human choice from its deterministic structure by introducing alertness. Alertness to unexploited gains from trade sets the market process in motion.” Hence, Kirzner holds a unique place among authors on entrepreneurship theory because of the way he focuses on the essence of the phenomenon at stake and its importance in the market process. In addition to Kirzner’s essays, Essence contains several critiques of Kirzner’s work centered on the topics of entrepreneurship, market process, and supply and demand. Kirzner’s response to each of these critiques shows that he welcomes criticism as an opportunity to “crystallize and sharpen” the difference between the normative views he espouses and contemporary economic theory. The painstaking precision with which Kirzner defends his position shows why his work has become such a staple of Austrian economic thought. Introduction to the Liberty Fund edition, index.